Stop Press - MIH In The News! This week Made In Hackney is in the news not once but twice! 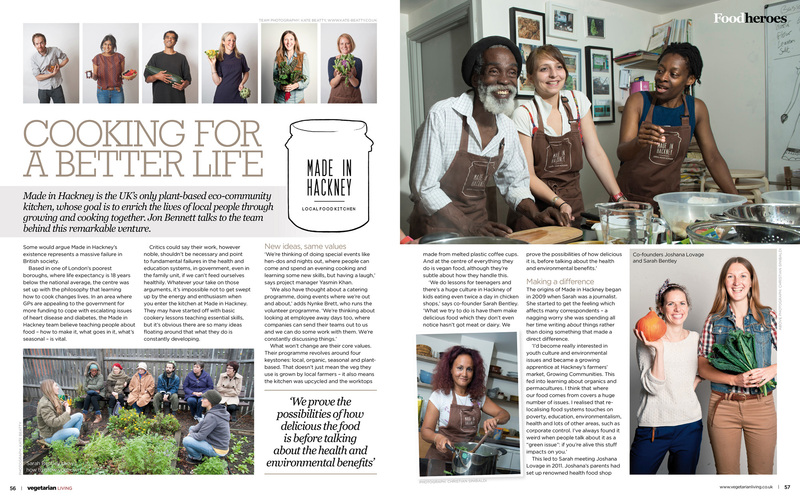 We have a gorgeous three page feature (see above) in the September issue of Vegetarian Living magazine (p56) and a fantastic piece in Transition Free Press (p18). We have the power of Twitter to thank for the Vegetarian Living article. And the wonderful Fat Gay Vegan (@FatGayVegan) for recommending us to VL (@VLMagazine) following their call out for an interesting eco community project on which to do an aritcle. Tess Riley is a journalist at Transition Free Press and got in touch with us direct to get her article; so thank you to all involved in making both of these articles happen, we're really happy that the Made In Hackney word is spreading! If you're unfamiliar with either of these titles they're well worth a read. Vegetarian Living is packed full of delicious plant based, seasonal recipes, just what we all should be cooking more of, and Transition Free Press is the newspaper connected to the seminal Transition Towns movement which looks at community led solutions to living in a post peak oil society. So there you go, Made In Hackney is attracting press attention and spreading the plant based eco word. And we couldn't be happier about it!